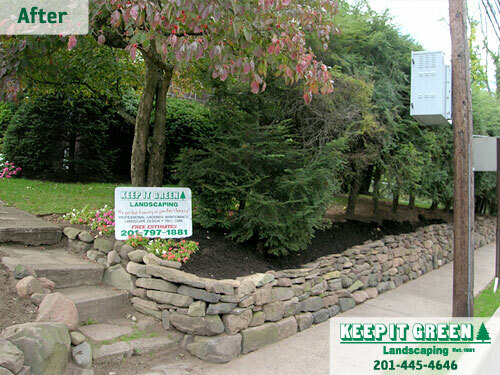 Keep It Green Landscaping provides the Bergen County NJ area with expert landscape design & installation services. Call today! Is your home or business in need of a makeover? Do you remember when the plants didn't block the view from the window? We'd like to help you. Our landscape designers will work with you to plan and build your dream landscape. We will bring together your personal tastes and our years of experience to create a sustainable landscape that incorporates the way you use your property and reflects your lifestyle. Perhaps a landscape renovation, leaving the best of the old and blending it with some new; even deer proofing, utilizing plants and perennials that are deer resistant and less likely to be eaten by deer. Whatever your landscaping needs, we'll work hard to install your dream. When your landscape design project is completed, we can provide all of the necessary follow up landscaping maintenance such as lawn mowing, tree & shrub pruning & care, lawn treatments, deer control/repellents, and a whole lot more. One professional landscape contractor to do it all for you. We'd like to be your a full service landscape company. Please call us and let us know how we can help you. On Site Examples of Keep It Green Landscaping's Residential Design/Build. On Site Examples of Keep It Green Landscaping's Commercial Design/Build. Whatever your landscaping needs are, we'll work hard to install your dream. 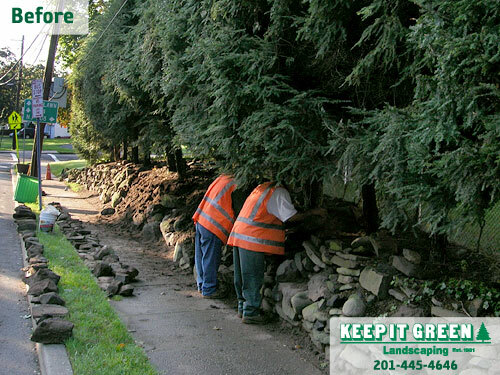 We service Ridgewood, Glen Rock, Wyckoff, Fair Lawn, Rutherford and surrounding areas.